If you haven’t already caught the first episodes of SK-II’s Bare Skin Chat, we’ll fill you in. 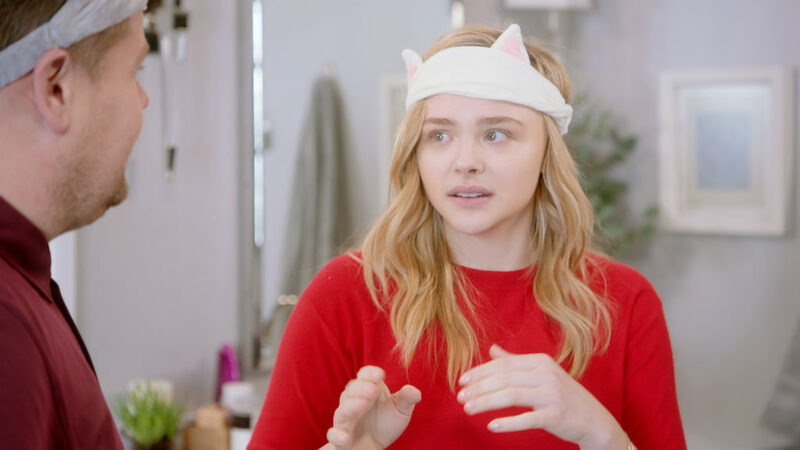 Best known for his iconic Carpool Karaoke segment on his show: The Late Late Show with James Corden, the latter has formed an unexpected duo with award-winning actress, Chloe Moretz, in the highly anticipated #BareSkinChat web series. In this short series, the duo promises a quirky take on skincare and the secret to clear skin with the coveted SK-II Facial Treatment Essence. In this week’s new episode, we finally see James inside Chloe’s bathroom (of all places!) while on his quest to find out her secrets to clear, smooth skin. The duo gets up to some fun hijinks while removing their makeup — with James protesting, “I’m not wearing makeup!” every step of the way. We don’t believe him for a minute, but his flustered protests and Chloe’s deadpan reactions had us chuckling throughout the whole episode. It’s only when James finally goes bare skin that Chloe reveals her skincare secret, which turns out to be just one product – SK-II’s Pitera™ Essence (also known as Facial Treatment Essence). James may be surprised, but we’re not. After all, the Pitera™ Essence has long been the backbone of SK-II’s skincare range and has gained its “miracle water” label in Asia. This power essence was formulated from a unique yeast strain that was discovered by SK-II over 39 years ago, and which is lauded for its amazing skin transformative powers. For all its effectiveness, you would think that the Facial Treatment Essence comes in a heavy formula, but that’s definitely not the case! The light, watery formula is designed to penetrate quickly and deeply into your skin, with no sticky residue. If you’re sold and can’t wait to use Pitera Essence to get your skin as glowy and beautiful as Chloe’s, then we have a few how-to tips for you to get the most of it all! Put it into a spray bottle and use it as a skin refresher during the day! It’s definitely no wonder that tons of people swear by this all-rounded product, and after witnessing Chloe’s radiant glow on #BareSkinChat, we’ll definitely be doing some DIY masking with Pitera™ Essence tonight! Interested to find out more about achieving that flawless radiant glow? Look no further. Subscribe to SK-II’s YouTube channel so you won’t miss out on any episodes of Bare Skin Chat!